Despite having decidedly juvenile tastes in breakfast cereals, before this month I hadn’t had a Cheerio in decades. That is until I saw that Cheerios had come out with a peanut butter flavour. I just couldn’t resist, being a sucker for anything peanut butter flavoured. When I picked up the box, I didn’t know just how good they’d be. Turns out they were so good that the ‘limited time’ flavour has become really difficult to find and General Mills’ Facebook page is swamped with consumer requests to keep the cereal coming! It’s not too sweet, with just a nice hint of peanut butter. Stays nicely crunchy in milk. (God I hate soggy cereal.) 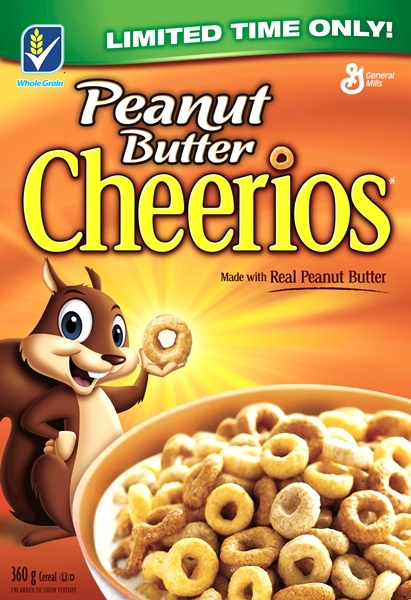 My next experiment will be mixing the peanut butter Cheerios with a box of chocolate ones. Just try to stop me. Long story short, try to find yourselves a box before they disappear. Or, if you live close to the border or are making a trip there, bring back a box. Turns out those Americans have had this flavour for a while and have been hoarding it. 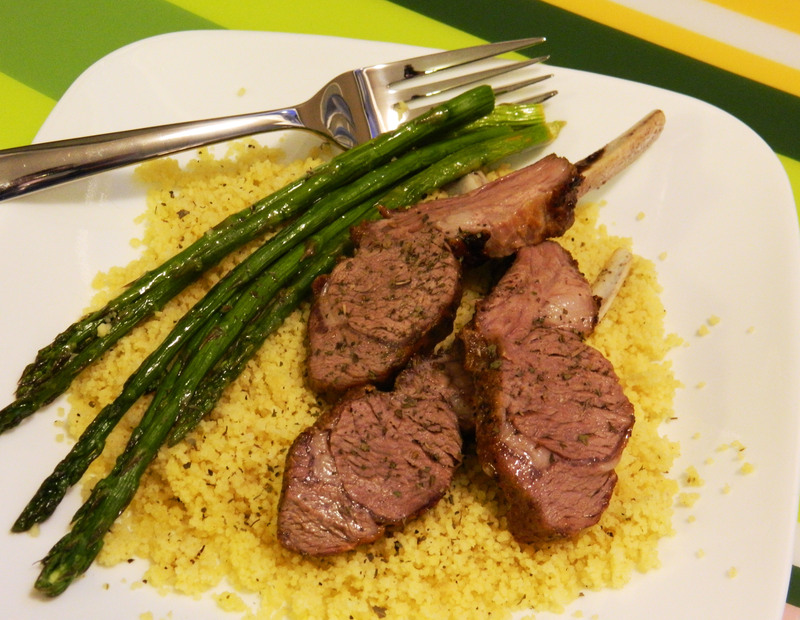 Rack of lamb is one of those cuts of meat that isn’t cheap, but it’s pricey for good reason. It’s tender, flavourful, quick cooking and looks incredibly impressive when cut into chops after roasting. 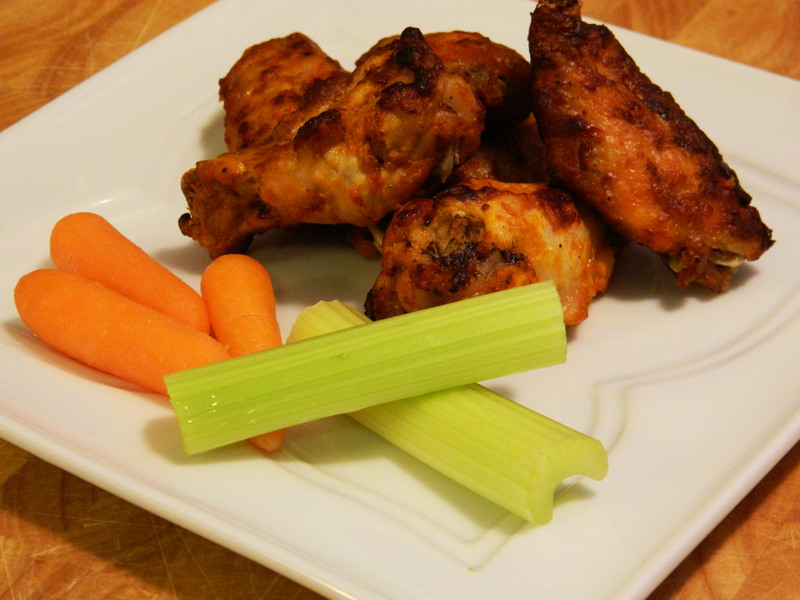 Serve this as a main course for a dinner party, or when cut into individual ‘meat lollypops’ and served with a mint yogurt dipping sauce, it would also make a great appetizer. Rinse and dry the rack of lamb. Slice the garlic in two and rub the meat well with the garlic pieces. If you’d like, you can slice the garlic thinly, cut a few slits in the meat and stuff them with garlic. Next sprinkle the Greek seasoning liberally over all of the meat, back and front and rub into the meat. In an oven safe frying pan, heat a few teaspoons of oil on medium high. When it’s hot, add the meat and sear on all sides until a nice brown crust forms. When all sides have been seared, place the pan into the oven and bake for 22-25 minutes or until the lamb reaches an internal temperature of 150 degrees (for medium rare). Let the meat rest for 10 minutes before slicing and serving.